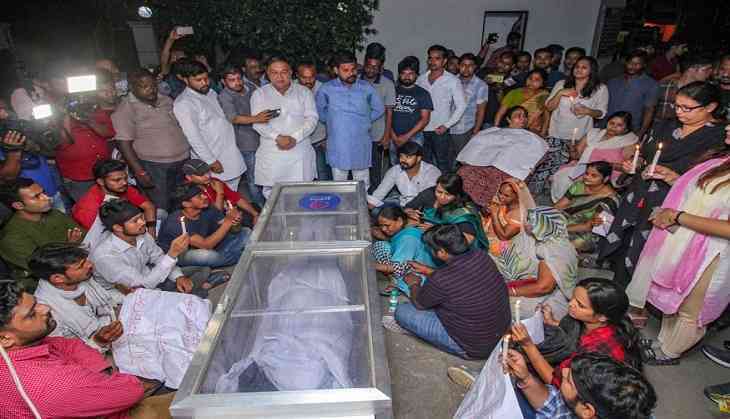 After a police officer shot dead an Apple executive in Lucknow for not stopping for a routine check, Uttar Pradesh irrigation minister Dharampal Singh tried to justify the killing by putting blame on the victim. He reportedly said that his government made no mistake in encounters. Sing was quoted by ANI as saying “Bullets are hitting only those who are criminals. ‘Gundaraj’ during Samajwadi Party's regime is making noise, everything else is normal. We will not compromise when it comes to criminals”. Singh’s comment is in stark contrast to chief minister Yogi Adityanath’s standing. Apple Executive Vivek Tiwari was shot dead by police officer Prashant Chaudhary when he was travelling in his car with a female colleague in Gomti Nagar Extension at the midnight of Friday and Saturday. The incident happened when the police tried to stop him while patrolling but Tiwari did not stop sensing trouble. Tiwari lost the control of the car after he was fired at by the police and rammed into the police officer’s motorcycle parked next to his vehicle before hitting an electricity poll a few meters away. He was taken to Lohia Hospital where he succumbed to injuries. After an FIR was lodged against the accused officers, the accused officers Chaudhary and Sandeep Kumar were arrested. According to Tiwari’s postmortem report, Tiwari died due to a firearm injury from a bullet on the left side of chin. He left behind his wife and two daughters. Talking to media, the accused police officer said “I tried to stop the car as it was quite late but the driver did not stop. After which he tried to run the car over me. Ultimately, I had to fire. My bike was damaged completely in the incident."